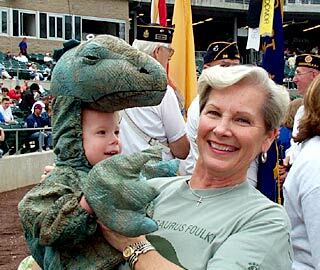 CAMDEN, N.J. -- Max Pollack, 2, in a dinosaur suit, and his grandmother, Haddonfield Mayor Tish Colombi, opened Haddonfield dinosaur sculpture day ceremonies at Campell's field, home of the Camden River Sharks baseball team. The event produced almost $3,000 for HATCH's drive to raise more than $100,000 for the creation of an outdoor bronze sculpture commemorating the town's famous dinosaur, Hadrosaurus foulkii. Behind the two, members of the Haddonfield American Legion Post 38 form up as the day's honor guard. 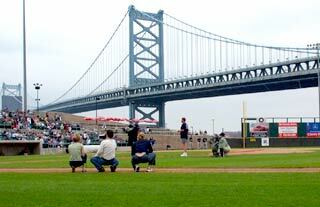 More than 600 people purchased tickets for the event at the stadium on the shore of the Delaware River adjacent the Benjamin Franklin Bridge. At center field, Cole Pollack, 5, threw out the day's first pitch, assisted by his younger brother, Max. After the pitch, the ball was autographed by River Shark players. 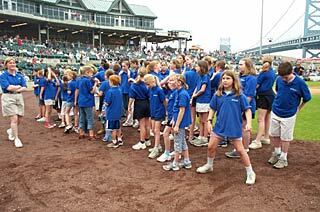 After singing the national anthem, blue-shirted members of Children Song also enjoyed their romp around the ball field. Also appearing as the day's "Dream Team" was Haddonfield Girls Softball Team #1 whose members got to meet players from the River Sharks team. The groups were among the forty different Haddonfield organizations that took part in the day's activities. HATCH spokespersons noted that the dinosaur sculpture is on schedule for permanent installation and dedication at its downtown site this October. Watch this Hadrosaurus.com Web site for further details.